Storymovies (DVD) by Carol Gray. This video is designed for student’s ages 8-12 diagnosed with high functioning autism or Asperger’s Syndrome. Volume 1 addresses school related concepts and skills and the unspoken factors that give meaning and predictability. 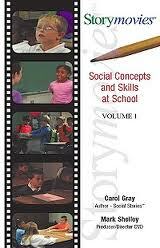 This entry was posted in Our Library, Social Skills and tagged Autism Spectrum Disorder, DVD, social skill. Bookmark the permalink.